The Center for Ocean Observing Leadership maintains a global presence with regular collaboration with partners world wide. 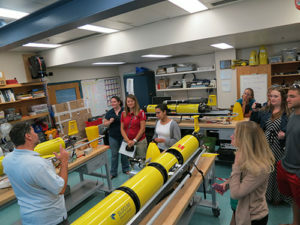 Scientists from 5 institutions – Rutgers University, University of Delaware, Oregon State University, University of Alaska Fairbanks, Polar Oceans Research Group – collaborated on a multidisciplinary project between 2013-2016. The team used a field study to investigate the impact of local physical processes on Adélie penguin foraging ecology in the vicinity of Palmer Deep off Anvers Island, Antarctica. The study utilized multiple platforms including remotely sensed surface current maps, an in-water (sub-surface) mooring, autonomous underwater vehicles (AUV), small boat acoustic surveys, and satellite telemetry of the Adélie penguin to collect data to answer their questions. 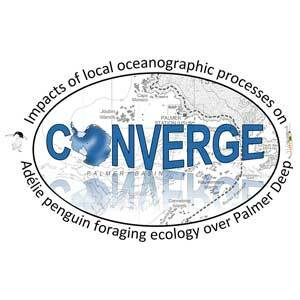 The data was collected to help the science team determine the distribution of the phytoplankton and zooplankton which influence Adélie penguin foraging ecology to understand how local flows structure the ecosystem. Educators from New York and New Jersey were selected for the yearlong collaboration with scientists as part of Project CONVERGE to bring the polar research to middle and high school students. The teachers began preparing in the summer of 2014 with a weeklong workshop at Rutgers University. 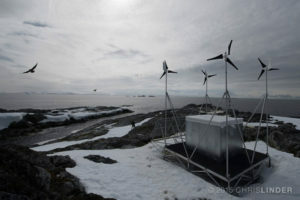 In January 2015, the teachers and their middle school students participated in a series of live video calls with the scientists in Antarctica, and followed a professional science blog. 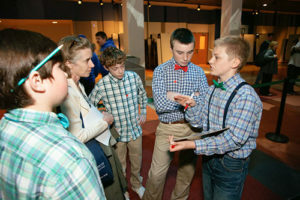 Following, the students conducted their own ocean science investigations; the top groups from each school presented their results to the science team at the Student Research Symposium at the Liberty Science Center. This project was designed to help students experience and practice the skills of scientists: asking science questions, analyzing and interpreting data, and planning and carrying out science investigations. These are important goals and objectives of the Next Generation Science Standards, which had been newly adopted in New Jersey and were being considered in New York at the time of the project. By partnering with the Cornell Laboratory of Ornithology we were able to host two hour-long live video broadcasts with ornithologists from the Adélie penguin colony on Torgersen Island. The featured researchers described their research project that was based out of Palmer Research Station, Antarctica, how they were investigating the functioning of the Antarctic ecosystem and how changes in the ecosystem were affecting the Adelie penguin populations. Questions from the participating audience members directed the conversation and information shared. 22 Science Teachers from grades 6-9 and their students (~950) participated in the year-long comprehensive partnership with the science team. ~7,000 science-interested members of the general public participated in the 2 hour-long video broadcasts from the penguin colony. These outreach components provided both a deep connection into the content and process of science for almost 1,000 teachers and students as well as connected over 7,000 people throughout the globe to the collaborative research being conducted down at Palmer Research Station in the winter of 2015. The teachers and students felt a part of the research mission and were extremely invested in the scientists’ work and findings. The participants of the live video broadcasts were able witness a live penguin colony and have their questions answered in real time about the birds, ecosystem, and polar research.